Thursday of Holy Week would be the last time that Jesus gathers with his disciples prior to his crucifixion at noon on Friday. All four gospels give us some of the details of the setting and the conversation, but John’s gospel is by far the most detailed. He gives five chapters (13-17) of Jesus’ “final” words to the men who were closest to him and commissioned to carry out his mission. In these chapters Jesus demonstrates what being a servant-leader is all about during the Last Supper; he institutes a new command; he promises the arrival of the Holy Spirit; he leaves his disciples with some final words of wisdom; and he prays to the Father on behalf of the disciples as well as all who would follow him in the future, including you and me. In John 13 Jesus and his disciples gather together to share in The Lord’s Supper. During these moments we see something of the unique love that Jesus has for those who follow him as Jesus washes his disciples’ feet and explains to them that service is the best form of leadership. Being a Christian does not simply mean eternal life or an escape plan from hell or a crutch to hold onto in difficult times. Being a Christian is to be in a close, interpersonal relationship with the Lord of the universe who created you, sustains you, and has forgiven you of all the wrong you have done and continue to do. Here in John 13 we find the King of Everything humbly washing the feet of his disciples in an amazing demonstration of the fact that the greatest leaders are servants first. As he breaks bread with his disciples, Luke records Jesus as saying, “This is my body, which is given for you. Do this in remembrance of me.”” And as he gives them the wine he says, “This cup that is poured out for you is the new covenant in my blood.” Jesus’ words echo those of Moses in Exodus 24 when God established the “blood of the covenant” at Mount Sinai. Here, God establishes an entirely new covenant with his people, not like the old one. This covenant would be a covenant of grace through the death of Jesus that was about to take place on Friday. Salvation now comes to all who put their faith and trust in Jesus alone. What a reminder the Lord’s Supper is that our God loves us so much that he would die for us, dine with us, and give us this meal as a way to continue to remember the greatest demonstration of love that has ever been done! Later in the meal Jesus instructs the disciples with a new commandment love one another just as he has loved them. This is where the word “Maundy” comes from. 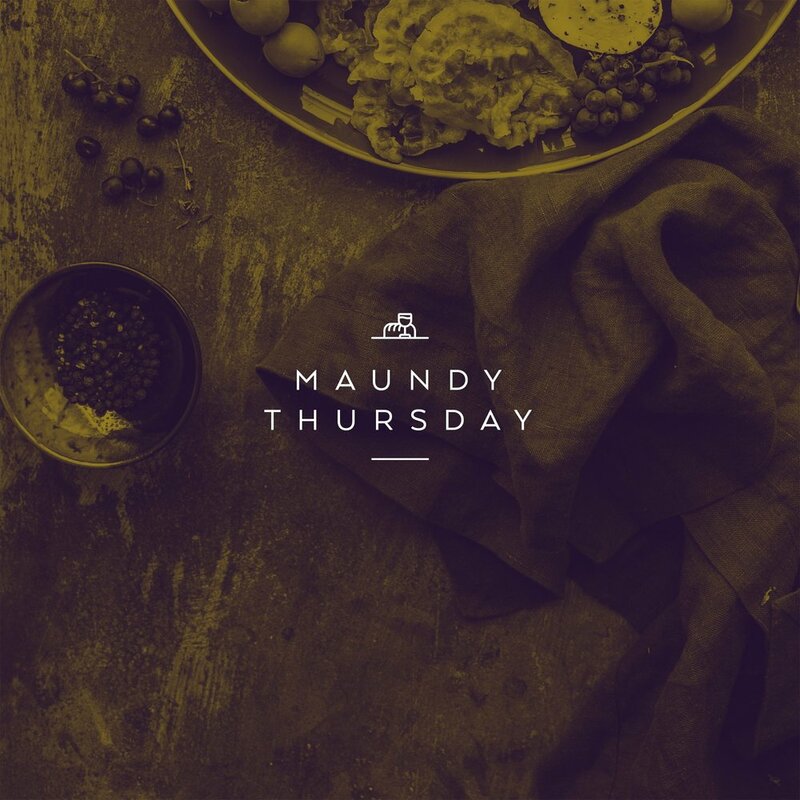 Maundy is an English rendition of the Latin word “mandatum” which means commandment. Jesus commands his followers to love one another just as He has loved us. Think about how incredible that is. Jesus demonstrated the ultimate sacrifice by laying down his life for his friends. Now he calls us to return the favor to one another so that all may know that we are his disciples. Nothing really demonstrates the truthfulness of Christianity better than the authentic family of faith. Jesus’ followers are called to love and forgive one another, displaying a unity and a brotherhood (and sisterhood) that goes unparalleled by any other institution in the world. To help in this task Jesus promises to send the Holy Spirit (his “Helper”) in John 14 to teach and guide all believers after he leaves this earth. This special gift of the Holy Spirit is the guarantee and deposit of our salvation. The desire of all of the saints of the Old Testament was for God to be with them, to dwell with them. Here Jesus promises exactly that to ALL of his followers! Through the Holy Spirit, God dwells with us. Amazing. The Holy Spirit guides us when we don’t know the way. He helps us to understand the Scriptures we read and brings them to the forefront of our minds when we need them the most. He comforts us in our troubles and reminds us of the origins of our blessings when those troubles come. He convicts us of our sinful desires and challenges us to conform to the character of Christ. He is our motivation to love fellow believers when they continuously prove to be difficult to love, reminding us that Jesus himself performed the most difficult act of love. Finally, Jesus goes on to explain how true growth happens for his disciples when we abide, or remain, in him. It is essential for Jesus’ disciples to stay connected to him through prayer, Bible study, worship, fellowship, and service. And when this life becomes difficult, as it inevitably will, we can take heart in the midst of our troubles because Jesus has already overcome the world. Jesus then prays in John 17 for all who would follow him, asking the Father to give us the same deep and loving relationship that God the Son shares with God the Father and God the Holy Spirit. Later this night Jesus would be arrested and brought to an illegal trial, resulting in his death. John’s crystal clear point in these chapters is to demonstrate the depth of Jesus’ love for his followers – not just the twelve, but all who would believe in him on account of what the disciples would say. This love is a special and particular love for his followers. Elsewhere in the Bible God calls Christians his “sons” (Gal. 4), his “friends” (John 15), his “brothers” (Matt. 28), his “body” (1 Cor. 12), his “bride” (Eph. 5), and his family (Luke 8). Sure Jesus loves all of humanity to a certain degree. He created us and he sustains us. Every human being regardless of what they believe owes their life and joy to Jesus Christ. However, those who have willfully rejected Jesus as God get no share in the Holy Spirit. The promises that believers can cherish do not hold true for anyone who takes his unbelief to the grave. Not following Jesus means you do not get to call God your Father, Jesus your brother, or the household of God your family. Not following Jesus means the Holy Spirit does not dwell with you and you will not inherit eternal life – that kind of love is reserved for Jesus’ followers ALONE. This Easter take time to consider what it means to follow Jesus and what the outcome of the alternative would be. Jesus welcomes anyone who wants to come to Him and it’s our prayer that you would do just that.